There was a time not that long ago when I had never even heard of the Cheltenham Festival, the world's premier jump racing meet. Now, along with the Kentucky Derby, Saratoga and the Breeders' Cup, it's one of the four cornerstones of my racing year. This year I have the pleasure of writing in this space, making a few videos and tweeting throughout the festival for the Twinspires blog. My goal is to provide some of the feel of what it's like to attend one of the world's great horse racing spectacles, and hopefully find us a few winners along the way. I am thrilled to be part of Twinspires ongoing Festival coverage and I encourage all racing fans to check it out. What makes Cheltenham so special? The sheer level of passion and enjoyment of the fans simply can't be matched. My first Champion Hurdle remains one of my most cherished Cheltenham memories. 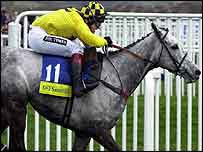 I stood in the packed granstand, which literally shook as a big, gray horse named Rooster Booster stormed up the famed Cheltenham hill. I am used to fans cheering for horses by their numbers, "Come on 2," "Hurry up the rail with this 1," even "Show me the 5." But as the crowd around me lent their support to Rooster Booster, something far more personal was happening. They exhorted him on like an old friend, even family, "Go on my son," "Come on, Rooster," and my personal favorite, screamed by a woman to my right with an accent straight out of Monty Python, "FLY ROOSTER, FLY!" After the race, I headed to the winners' enclosure, where not just the winning connections, but scores of fans crowded around to see Rooster up close. Many had bet on him, but more came just to give him a hand and offer thanks and praise to the hero of the hour, their champion. Toto, I don't think we're at Aqueduct anymore.